One of the great joys in Sea of Thieves, Microsoft’s raucous pirate sim, comes from dropping the anchor while sailing at full speed. Rather unrealistically but totally amusingly, your ship performs a handbrake turn, perfect for docking quickly or dodging enemy cannonballs. Sea of Thieves is just about to execute a handbrake turn of its own when it radically changes course later this month a year after its launch on Xbox One and PC. In fairness, much of Sea of Thieves’ evolution in its first 12 months has been leading to this point. And when the Anniversary update goes live on April 30, it will change the game for the better. But, until now, the mantra for developer Rare has been “Players creating stories together”, leaving narrative to one side and enabling user-generated drama in a shared world to drive engagement. Rare gave you the ingredients – a crew, a ship, treasure, cannonballs, skeletons, etc – and the result was usually a slapstick stew of comedy gold. Yet newcomers often felt out of their depth and many noticed the lack of a thread pulling them through the game’s growing stock of activities and adventures. So Anniversary introduces Tall Tales, a series of chapters with a clear-cut storyline, goals and rewards that has more than a whiff of Indiana Jones about it. It also adds the Arena,a tightly focused PvP mode that condenses SoT’s sea battles into furious 24-minute skirmishes. Rare sees no conflict in suddenly shifting the game’s axis. At a press day last week in the developer’s base outside Birmingham set among 100 acres of rolling fields, studio executives Joe Neate and Shelley Preston made their pitch and defended their decision to pivot between two directions. “I don't think there's a tension,” says Neate, the game’s executive producer. “I think there's an opportunity which is that basically what we've learned with the kind of updates that we've done over the last year. The Hungering Deep [released in May], The Cursed Sails [July], Forsaken Shores [September] – they all introduced story as part of a timed campaign bringing in the new features and giving you this kind of little taster of story to go and play in the shared world. “It drove really interesting shared behaviour in this world. It got multiple crews together. The updates proved that we could have story in a shared world and it would give people what they love, which is this crafted narrative but in this shared world and all of those amazing encounters with other players. Indeed, a playthrough of the first chapter of Tall Tales – of which there nine in the first volume called Shores of Gold – demonstrates that the same anarchic action we’ve come to love remains in the new Sea of Thieves. You can revert to aimless plundering and ship-to-ship combat at any time while following the multi-stage clues to locate this chapter’s MacGuffin. And Rare has made the Tales replayable by randomising some of the elements within – the start and end points will always be constant but the route you take will vary, not just geographically but task-wise too. Tall Tales is almost like a tutorial, I suggest to the Rare pair. Preston says: “I think it depends on the player. I think for certain players it's a fantastic like on-ramp where you come into Sea of Thieves and you can experience the world through this more authored thing. But I think like it's gonna be equally great for players who've been playing for the past year. 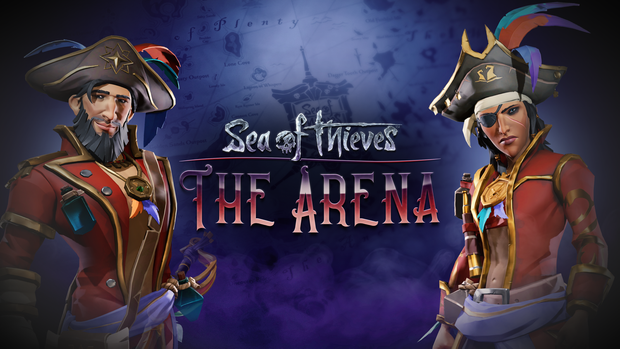 But lest you think Sea of Thieves has suddenly morphed into Sea of Friends, Rare puts just as much emphasis on the Arena in the Anniversary update, so much so it gets its own menu item on the Start screen. While random encounters with other crews were always enjoyable, Arena boils down the PvP clashes to their spiky essence. It’s a concentrated blast of ship-to-ship combat in which the goal is a score-based race to dig up as much treasure as possible, which then needs to be banked at another location. But by limiting each match to just 24 minutes and tightly corralling the play area, crews are forced into conflict, whether that be devious ambushes or full-on assaults. 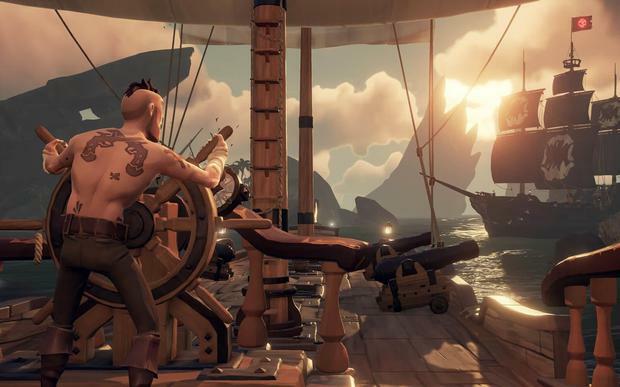 Rare has been true to its promise of pushing out generous dollops of new content every few months in year one but Sea of Thieves can’t go on forever unfunded, even with Microsoft’s deep pockets behind it. The inevitable dawn of microtransactions has been well flagged – but Neate says the introduction of purchasable cosmetic items such as pets is still some months away. Rare is open about the fact that being owned by Microsoft grants it certain luxuries not afforded to independent developers. 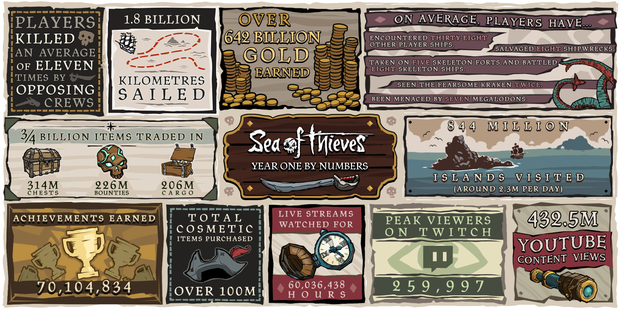 In fact, Sea of Thieves has a higher calling than just selling bucketloads of copies. Before Rare gets to please its big bosses, of course, it has to please its players and the studio adopts an uncommonly open relationship with its fans about the game’s development. 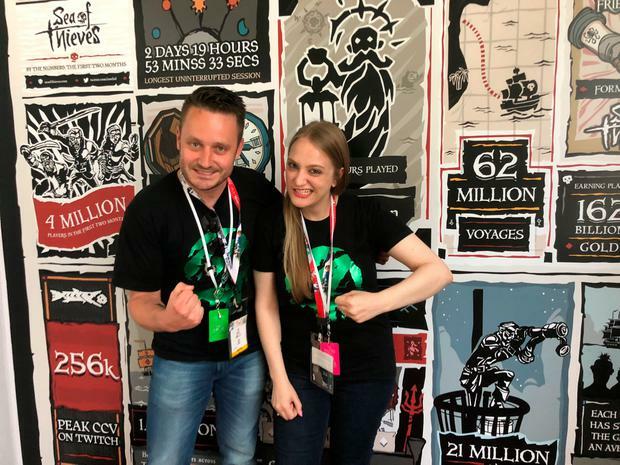 It runs an Insiders Programme – offering members early access to new features – which recently increased in size from numbers in the hundreds to numbers in the thousands. With that brings immensely valuable feedback but also the darker side of human nature. Neate and studio boss Craig Duncan both felt driven to make impassioned pleas for civilised debate due to the toxic nature of some of the opinions voiced about new features or problems with the game. In person, he explains his thinking, going back to the wobbly launch last year where Sea of Thieves came under fire from critics and players that the world was a little empty. “That tweet was as much about any game as it was about us. We've always been very passionate about being open and transparent and being on the front foot and talking and doing our weekly videos and all this stuff. But we had a bumpy road at launch. “It would have been easy to retreat into our shells because everyone was kind of going there's not enough stuff or it's not working or you haven't got this in or whatever. I can look at other games and I can see that kind of happening with people coming and wanting to be open and maybe backing off a bit just because it's human nature. 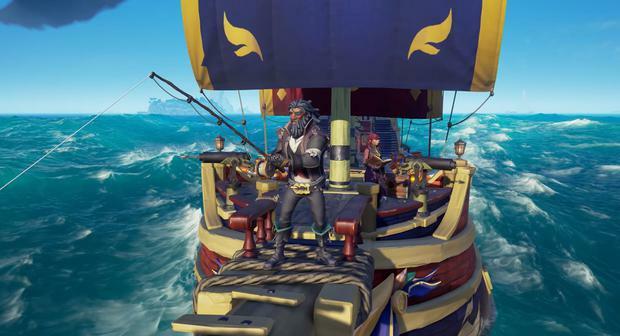 One area where Sea of Thieves excels is its sheer streamability, with even Fortnite fan Ninja drawn to the pirate’s life earlier this year, something that drove a welcome spike in users for Rare. That watchability was part of the plan all along. Preston says: “It's not a formulaic thing where it's like, Oh if we do it like this it'll look great on a stream. But we were consciously aware right from the inception of Sea of Thieves we wanted something that was like that. Streaming was kind of in its infancy right back when we started. It was nowhere near as big as it is today but we knew by the time we were ready to launch this that it would be a lot bigger. “We had to just think about building our systems in such a way that players are having so much fun that that will come across in the game. They're working together and it's interesting to watch what they're doing and it's unpredictable. So what have they learned after several years of hard graft and more than 12 months of a live game as a service? Neate nods in agreement: “We believed in the magic of multiplayer and that you could do something different with multiplayer that drove mostly positive online social experiences that weren't just around the competition. That you can have all of these different stories and that you could bring people to multiplayer that maybe had been turned off by or just it wasn't quite for them because they didn't feel they were skilled enough. Or they didn't want to go into this really kind of competitive place and potentially toxic kind of place.